Yet another recipe to prepare ahead to help me (and you, of course) get ready for a more relaxing Christmas and Boxing Day. My freezer is almost bursting at the seams with goodies already prepared for the Christmas period – I just have to keep making lists of what I have actually cooked and frozen and where abouts it is in the freezer. This next choice, the Frozen Strawberry Meringue Cake recipe, is from chef Rachel Allen and taken from the Good Food channel website. Rachel gives the recipe to make your own meringues, but also suggests that to save time, you could buy 16 meringue nests from the shops to use instead. I have included Rachel’s recipe for making the Meringues, but when in a rush, I will be using good shop bought ones. Dare I also suggest that this would be great with mixed berries i.e. raspberries, blackberries etc, just using the same amount as Rachel suggests for the Strawberries. 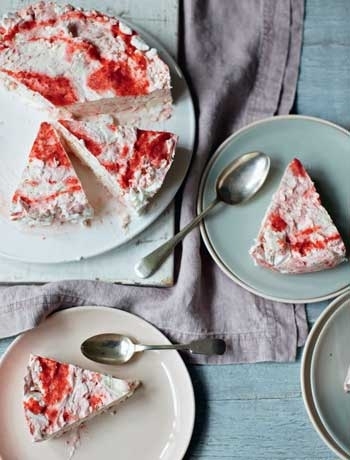 This Frozen Strawberry Meringue cake recipe sound a lovely refreshing one to serve over Christmas, but in summer it would taste just as good. To make it quick to put together, Rachel suggests using shop-bought good meringue cases, but I have given the full recipe with her own recipe for making meringues, as it sounds a really helpful one. You could change the Strawberries for Mixed Fruit Berries as well. Preheat the oven to 140C/120C fan/Gas1 and line two baking sheets with baking parchment. Place the egg whites in a large, spotlessly clean bowl, add the salt and whisk into soft peaks. Add the sugar, 1 tablespoon at a time, whisking between each addition. Continue whisking between each addition. Continue whisking until all the sugar has been added and the meringue forms stiff, glossy peaks. Using a large spatula or metal spoon, fold in the vanilla extract. Using a tablespoon scoop up a heaped spoonful of the meringue mixture, then use a second spoon to scrape the mixture onto one of the lined baking sheets. Repeat with the remaining mixture, leaving a little room in between meringue. Alternatively, spoon the meringue mixture into the piping bag and pipe a series of small mounds or rosettes, each approximately 7 cm in diameter, onto the prepared baking sheets. Bake in the oven for about 30 minutes. Unless you're using a fan oven, you will need to bake the meringues in two batches. To test whether the meringues are ready, gently lift up one and press the base - it should be crisp but give way with a bit of pressure. If possible allow to cool down completely in the oven, the the heat switched off and the door slightly ajar. Transfer the cooked meringues to a wire rack and they will crisp up further as they cool. Line a 23cm springform cake tin with a double layer of cling film. In a food processor or blender, whizz the strawberries with the lemon juice and icing sugar, then pour the mixture through a sieve into a bowl and discard the seeds left in the sieve. Pour the cream into another bowl and whisk into soft peaks, then crumble the meringue into the whipped cream and stir together to mix. Add the strawberry sauce, swirling it through the cream and meringue mixture. Tip the mixture into the lined cake tin and smooth the surface with a spatula. Wrap the tin in clingfilm and freeze for at least eight hours or overnight. Take the frozen cake from the freezer, then unclip the sides of the tin and carefully lift these away. Remove the cling film from the sides of the cake, then using a palette knife or metal fish slice to carefully transfer the cake from the base of the tin to a serving plate. Cut into slice to serve, either on its own or with fresh strawberries. In my search for recipes which would help me to prepare ahead for Christmas Day (or a special meal or occasion), I have come across far more than I thought I would. This Frozen Strawberry Meringue Cake recipe is yet another one, and sounds perfect for the busy cook. Although Christmas is almost upon us, I will keep finding recipes that can be either frozen or prepared well ahead. So keep looking. I do hope they are as useful to you as they are to me. Right! That’s enough of writing – now for some cooking.